The amount of data we own is increasing, be that private data or confidential business data. This applies to companies too. The ever-increasing data volumes within companies mean the standard limits on storage capacity prevent backups for such large amounts of data being made. That is why O&O Software has developed the brand new version 14 of O&O DiskImage with increased storage capacity. Creating images of entire servers is one of the standard measures currently taken by companies for protecting their data and system configurations. O&O DiskImage Server Edition takes this once step further by providing features that make your job as an Administrator significantly easier. It is vital for all companies that they save their electronic data. If it is lost, it is not just customer data or financial data that go, but business relationships are also destroyed. Would you like to have to ask your customers or suppliers again for their data? And at the same time be forced to confess that you were sadly not careful enough with use of their data? This is certainly not what your business partners want to hear, and they would justifiably reconsider their relationship with you, or simply terminate it. New in O&O DiskImage 14 is support for VHDX. This virtual format has many advantages over the previous VHD format. Increased storage capacity: Images of up to 64TB can now be created, compared with the old limit of 2TB, and file corruption protection where changes in the Metadata are logged so that a clean rollback can be made if a change was not successful. O&O DiskImage 14 now supports this format. Backup and restoration in Hyper-V environments make migrating from physical to virtual machines easier. We have also completely overhauled VHD support and generated e-mail notification texts. Previously, in addition to regularly backing up your machines, you also had to separately create an O&O DiskImage boot media to restore that backup. Everything is easier now! The new DiskImage To Go function automatically turns an external hard drive that you select to store an image on (or USB flash drive with enough storage space) into an O&O DiskImage boot medium, and marks this disk as the preferred storage medium for future system backups. As soon as you connect this external USB hard disk to your computer, O&O DiskImage 14 automatically creates an image of all internal drives and the data partition onto it. This makes it easy to create recent backups and images. And, if something really happens to one of your workstations or servers or you want to transfer your system and all your data to a new machine, then with the O&O DiskImage boot medium you can restore the image stored on it with just one touch of a button, without the hassle of searching for the boot medium and the external hard drive with the backup. It has never been so easy to ensure the security of your company data! A regular backup is still something that many users prefer to avoid. At least that is until they suffer their first loss of important files as a result of software, hardware or user error: that’s when it becomes crystal clear just how valuable a reliable and up-to-date backup really is. 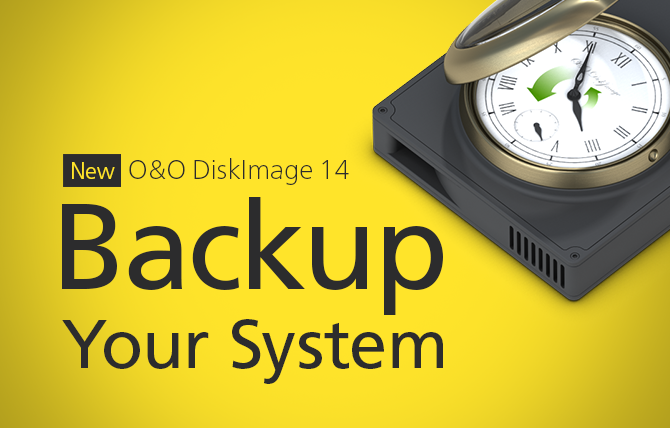 When you back up a machine, O&O DiskImage saves all files as well as hard drive information and individual settings. This not only protects irreplaceable files but, in a worst case scenario, also saves you the trouble of having to carry out a time-consuming new setup of programs and the Windows operating system. If you need to restore the Image onto a new workstation or server with different hardware then O&O DiskImage 14 can do this no problem. The integrated MIR function (Machine Independent Restore) enables this for you regardless of the hardware manufacturer or setup.